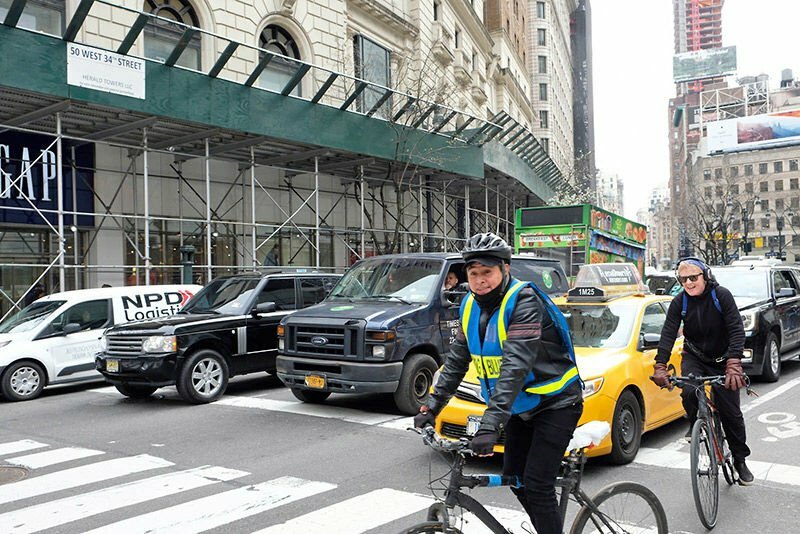 TRAFFIC, TOLL BURDENS: The congestion-pricing legislation included in the recently adopted state budget would presumably ease bottlenecks such as this one on Sixth Ave. near 34th St., as well as fund the subway system’s capital repairs. 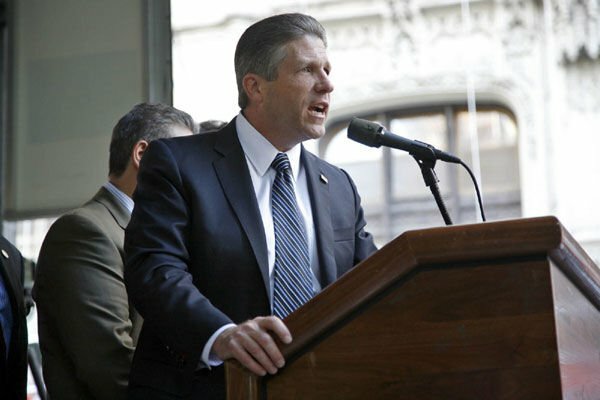 But union leaders, most prominently Police Benevolent Association President Patrick Lynch, say their members would be unfairly burdened by the tolls. PATRICK J. LYNCH: Cops deserve a break. Although details on the congestion-pricing plan adopted under the state budget deal concluded at the end of March may not be established until 2021, some union leaders are already lobbying for carve-outs for their members. Most prominent among them was Police Benevolent Association President Patrick J. Lynch, who, in a Daily News op-ed published April 8, maintained that Police Officers often have little choice as to where they will be assigned on any given day and would be unfairly burdened by the tolls. As a consequence, he wrote, first-responders and other public employees “in critical roles” should be exempted. That leaves many with few options except to drive, he wrote. “The burden should not fall on the backs of already underpaid city workers, especially not the public-safety professionals who protect the public,” he wrote. “There has to be some sort of carve-out for workers who make the city run,” he said. Like Mr. Lynch, Mr. Nespoli said that his members’ pay was already insufficient without the added toll. “They don’t have the salaries so they can’t live in Manhattan” and must drive into the borough as a consequence, he said. Messages left with the Detectives’ Endowment Association and the Sergeants Benevolent Association seeking comment on Mr. Lynch’s position were not returned. Preliminary estimates suggest the toll for entering Manhattan anywhere below 61st Street would be about $12 for cars and roughly twice that for trucks. Motorists using the FDR Drive or State Route 9A down the West Side (commonly known as the West Side Highway), as well as roads connecting 9A to the Hugh L. Carey Tunnel, would be exempt from the toll. The fees are expected to raise $1 billion a year, with the bulk of the revenue—80 percent—dedicated to capital improvements for the city’s bus and subway systems. The legislation calls for congestion pricing to begin sometime in 2021. Regardless of the initial costs, Mr. Nespoli said “it’s just a matter of time” before the toll increases. “Pat’s right, that has to be discussed,” he said. Mr. Nespoli said he spoke with Renee Campion, the city’s Labor Commissioner, about exempting his members from paying the toll. The union is in discussions with her on a new contract. The editorial also took issue with Mr. Lynch’s claim that Police Officers were underpaid and that the toll would therefore be a significant burden on cops. Teamsters Local 237 President Greg Floyd went further than Mr. Lynch. “All city employees should be exempt” from the toll, he said in an interview. “You’re going to be punished if you work in lower Manhattan,” said Mr. Floyd, whose union represents roughly 21,000 members who work in New York City, although not all of them in Manhattan. He asked: “With transportation being what it is, at night what choice do you have” but to drive in? But he reserved his most severe criticism for the architects of the plan, saying that it was rushed through without sufficient thought. He said the subway and bus systems should have been upgraded and improved before any imposition of what he called a tax. The state, he said, should have raised funds to fix the city’s transportation systems through dedicated taxes tacked on to the sale of cigarettes, liquor and lottery tickets.